That’s all you’ve got to say and they come running. 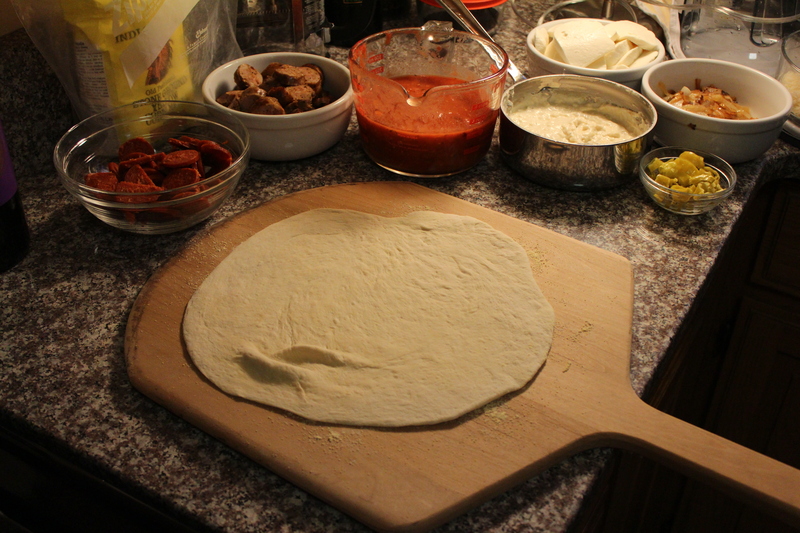 Few things make me as content in the kitchen as making pizza. It’s a slow-down, wine-in-hand, stop-and-smell-the-pepperoni, family-absorbing time. I putter around making dough and sauces, cutting up, and sauteeing… it can take as little as half-an-hour to prep or upwards of half a day, depending on my mood. Both can turn out faboo pies and attract wayward family members from the far corners. Old Nonnie emigrated to the United States from Naples, Italy, home of the most fantastic thin-crust pizza which is my personal favorite. I don’t know that Nonnie ever made pizza but Aunt Dot does, Monica does, and several of the cousins do. 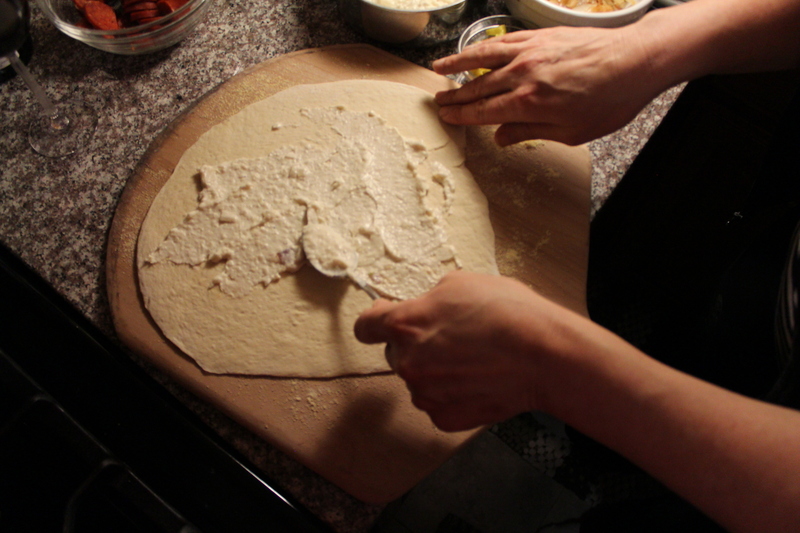 While on a trip to Italy, Aunt Dot ingratiated herself (her non-Italian speaking self so I am still curious as to the method) into the kitchen of a pizza master in Naples to get his secrets. She’s gotten something because the woman can make a fine pie. 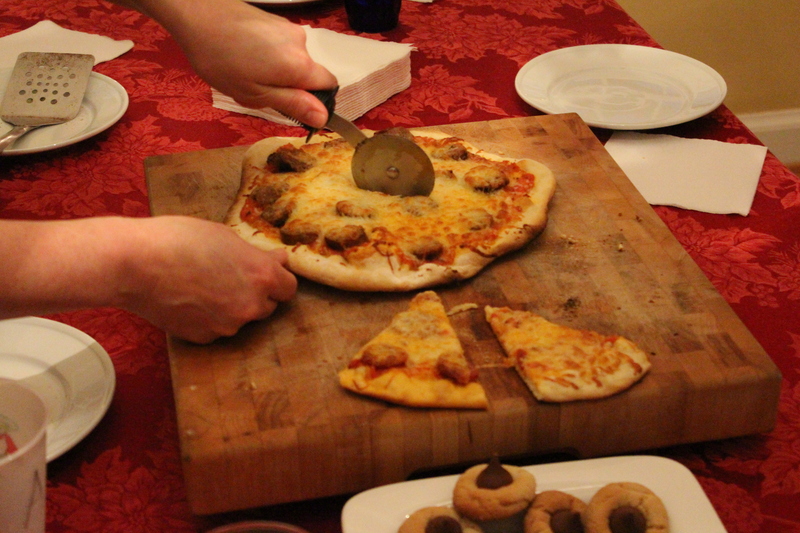 Come to think of it, a pizza throw down a la Bobby Flay with the family could be a lot of fun. Or not. I don’t have wine glass in hand at the moment so I’m leaning toward not. I’ll think on that one. My only research involves eating pizza. I like pizza. But I am very picky. I like a thin chewy-crisp crust. It has to have a bit of char on the bottom and not a lick of underdoneness to the dough. Oh, even typing that gives me the ughs. 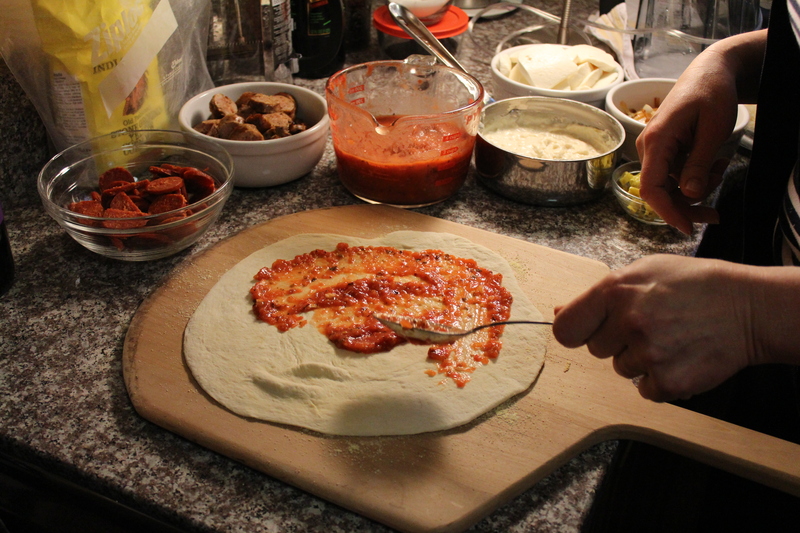 Sauce should be applied sparingly and so should the toppings. Those commercials on television for the $5 behemoth doughy triangles bending under the weight of grease-glistened toppings make me think a movement should be afoot to get people making their own. Once you see how easy it is, you’ll kick yourself for ever thinking that delivery of mass-produced demon dough disks is the way to go. I’ve been using the same dough recipe for years, snicked from Wolfgang Puck, always doubled (the recipe below is doubled) and usually rested for far longer than he recommends. Though some will argue that any old flour works, I’ve found that King Arthur Lancelot gives the best chewy-crispness to the crust. This has to be mail-ordered; however, so a lot of the time I use their unbleached AP. My red sauce is now an uncooked version, something I learned from Monica (my very favorite sister) after years of cooking my sauces. This is superior in fresh taste, leaves fewer pots to clean, and can be made last minute or early in the day to get to know itself until I’m ready to use it. My white sauce is a garlic lovers dream and can be supplemented and made over-the-top tasty with the addition of an entire head of roasted garlic. I am salivating as I type. Apologies if that’s gross. Toppings are whatever sounds good at the moment. I’m partial to the Margharita (red sauce, fresh mozzarella, and basil) and the double-garlic white with pepperoncini, mozzarella and Pecorino Romano or parmigiano if I’m feeling splurgy (Parmigiano Reggiano to be exact). May I take this moment to plead with you NOT to purchase that stuff in the green can. Ugh… read the ingredient list. No, wait, I’ll read it for you. Cellulose powder to prevent caking and potassium sorbate to protect flavor. You want to protect flavor and prevent caking? Grate it fresh. There. Done. Back to pizza. On to toppings… Sky’s the limit. A word to the wise, because pizza cooks so quickly, unless you are looking for rawness in your toppings, cook them first. Caramelize onions, roast and peel peppers, roast whole heads of garlic, cook sausage. You get the idea. Monica actually fries her pepperoni before she puts it on her pizza. As queen of the “I hate dirty pans” realm, I find that finely slicing it does the trick. So, enough chit-chat. Here you go. Pictures followed by recipes. If making pizza seems like more work than it’s worth (you’d be wrong, but, um…), invite a few friends over. And kids LOVE pizza parties. Crack open a few reds (this would not be for the kids, natch), and enjoy. For kicks, order a delivery deluxe-o pizza and do a taste test. And please, please come post the results. The dough is key. It’s easy to make but you need to make sure your ingredients are fresh, especially the yeast, to get the right texture. Once you see the yeast get bubbly, you’re good to go. I do it all in the mixer. Toss it all in and let the hook do its magic. When it’s done, I oil the bowl, cover it, and put it aside to sit for as little as one hour and as long as all day. This dough also holds well in the refrigerator for a few days (sealed in a zipper freezer gallon bag with a healthy dose of olive oil smeared around) and even the freezer (packaged the same). If you’re starting with a cold or frozen dough, you do need to bring it back to room temperature with a nice fluff to it (see pic below) before proceeding. If the dough is the key, the sauce is the lock. I’m not sure what that means but I couldn’t exactly say the sauce is the other key. You know what I mean. Use good tomatoes. Tomatoes that taste like tomatoes. I use the San Marzano because I like the flavor but whatever you like, go for it. For the best texture, use whole peeled tomatoes and drain them so that your sauce isn’t watery. I throw them into the Whiz-o-Rator 5000 (with a few cloves of garlic) and let them go until they look like what you see on the right. I then put in the basil and oregano and a pinch of red pepper flake and give it a quick whiz before I set it aside for however long it takes to start the pizzas. The longer the better but an hour is good, too. … into these. Mama likes her mise en place! Saute the sausages until they are cooked through. I like links that I can slice into nice bites better than the grumbles but to each her own. This episode found two kinds of onion and leeks. 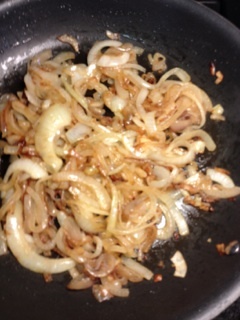 I cook until caramelized – about 20 minutes. The pic on the right is after about 10 minutes. And is sort of fuzzy. Let’s all thank Stepanie for not showing up until the oven got cranked. These are my photos. The dough has grown a little over twice it’s original size. It’s light and stretchy … and keeps a belly button. Oh, look, Horace, it’s got an innie! 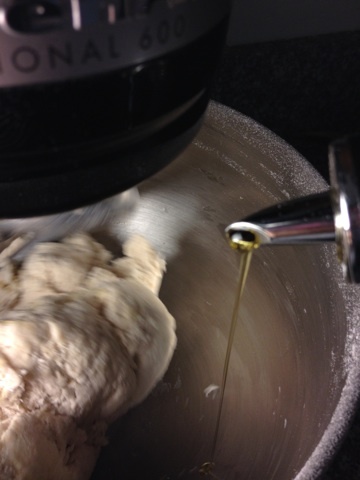 The dough is quite sticky and wet (this is good) so be generous when you flour your counter. I use, gasp, a rolling pin to get a nice round shape. I’m a bit detail-oriented, ahem. I’ll say though it has taken me years to get round pizzas. I used to do a lot that resembled South America but, you know, they’re all good if a bit difficult to cut uniformly. 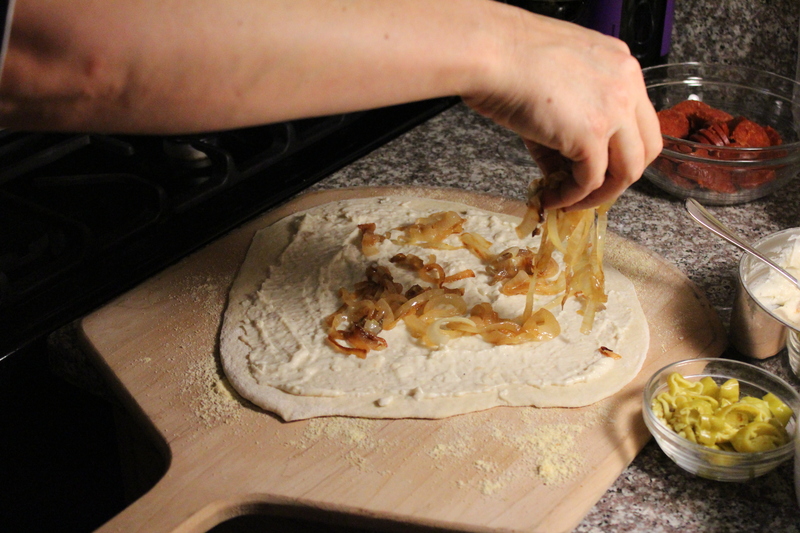 Put the dough onto a peel dusted with cornmeal. If you don’t have a peel, use an upside-down baking sheet so that you can slide it onto your stone. If you don’t have a pizza stone, do invest. It’s worth it. If not, this can be baked on a sheet pan but you’ll get an entirely different texture (it should be rolled thicker). Nah, get the stone. 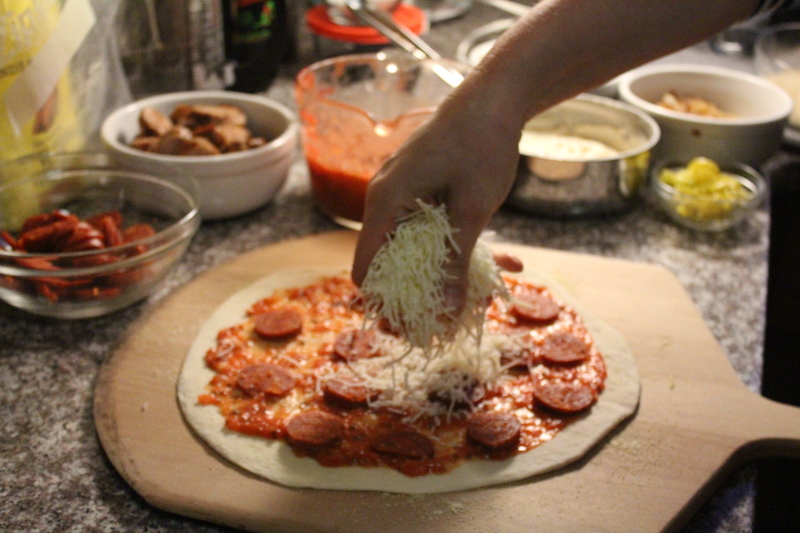 First up … Pepperoni! Smear the sauce on thinly leaving an edge to a) give you a place to hold on and b) keep the sauce from burning on the edges. My people like it heavy on the pepperoni so there it is. For this pizza, I’ve used a pre-shredded Italian blend with no fillers which are what give a lot of pizzas that plastic-y texture. For this awesome-but-without-a-name pizza, I spread the white sauce thinly as before, distribute a nice schlump of the carmelized onions, some chopped pepperoncini, and then top with circles of fresh mozzarella and a little of the parm. La la la …. happy dance. 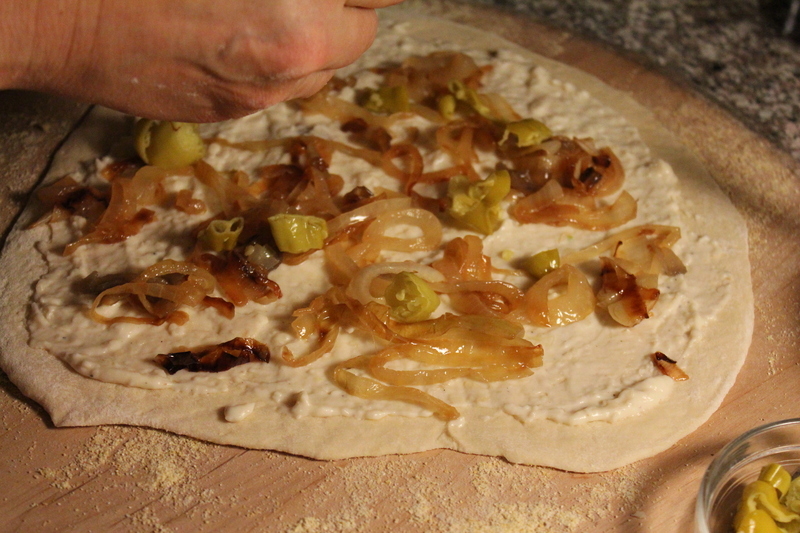 Going into the oven …. [eight minutes later at 475 degrees F] coming out of the oven. May I just point out that it takes delivery 30 minutes and the pizza is generally heading toward coagulation before you get to eat it …. 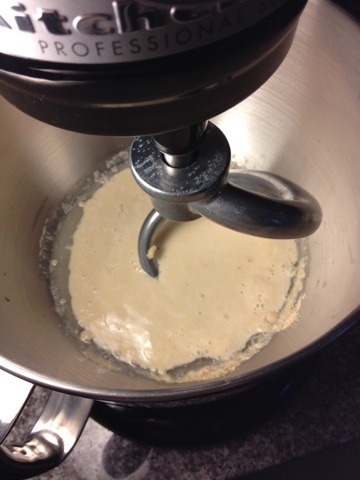 In the bowl of the mixer dissolve the yeast and honey in the water. Add the flour, salt and olive oil. With the dough hook in place, mix on low speed (2 on the Kitchenaid) for about 5 minutes. 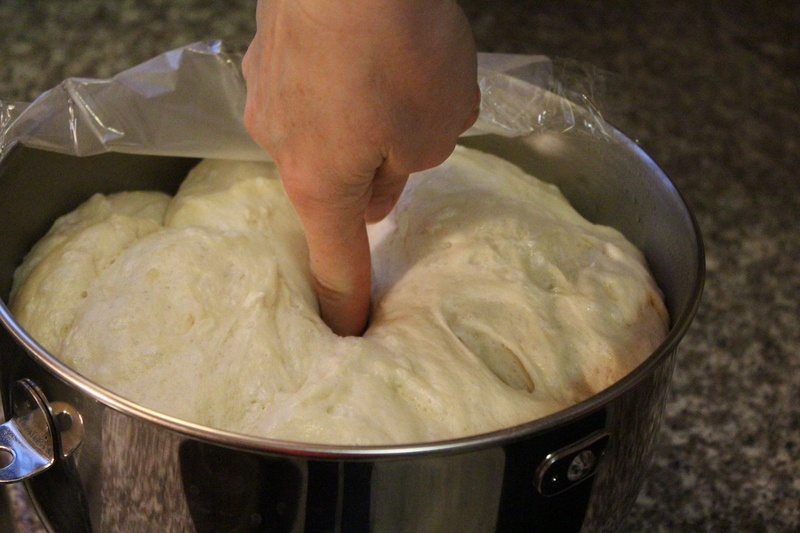 If you don’t have a dough hook, knead by hand for about 8 minutes. Cover the dough in the bowl – which you will have oiled – with plastic wrap and let it rise in a cool spot for at least one hour but much better after at least 2 hours and just fine if left all day. Any longer than bedtime, you need to put it into an oiled zipper freezer bag to refrigerate or freeze. Before using, let come to room temperature on the counter. It will expand so if your bag is small, you may want to transfer to a bowl for the duration. Preheat the oven to 450 degrees F for at least 1/2 an hour with the pizza stone on the bottom. Pinch off a piece of dough the size of a pool ball. 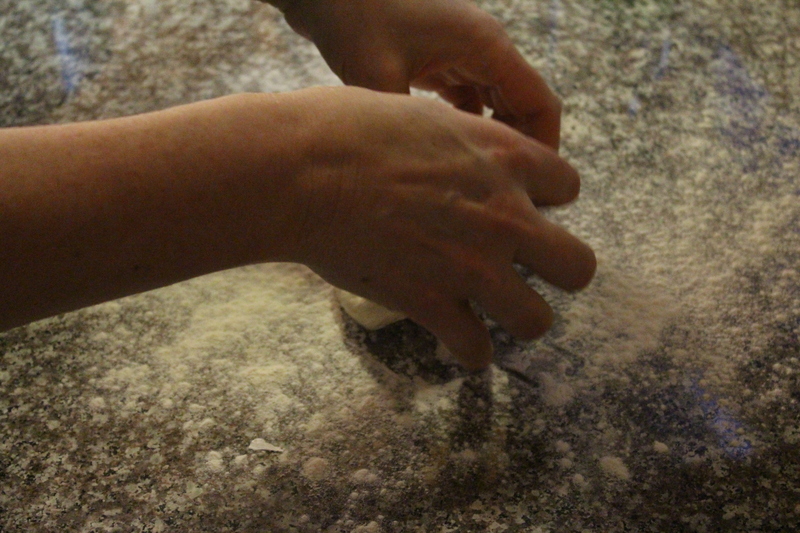 Liberally sprinkle your counter with flour and roll the dough ball with a floured rolling pin to a thin circle about 1/8 thick. Transfer to a cornmeal-sprinkled peel and add toppings. Slide from the peel to the pizza stone by lining up the top of the peel with the far edge of the stone and with slight jerking motions, slide it onto the stone. Bake for 8-10 minutes or until browned on the edges and the cheese bubbles. Drain the tomatoes with a sieve for 5 minutes. 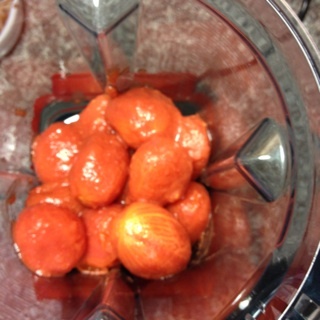 Put the garlic into the blender with the tomatoes and process until all of the large chunks are gone. Add the rest of the ingredients and pulse for a second or two. Transfer to a bowl until ready to use on pizza. If it will be longer than an hour, cover the bowl and refrigerate. No need to bring it back to room temp before using on the pizza. Put the butter and garlic into a small sauce pan on low heat and let cook until fragrant, about 5 minutes. Increase heat to medium and add flour, stirring constantly until golden. Add the milk and stir until bubbly. It will appear lumpy at first but these will smooth out with stirring. Let bubble for 1-2 minutes and take off of the heat. Add the nutmeg and cheese and stir until incorporated. The sauce will thicken as it cools. This entry was posted in Appetizer, Italian, Main Dish, Pizza and tagged baking, dough, family dinner, homemade pizza, Italian, olive oil, Parmigiano Reggiano, party, pecorino romano, pepperoni, pizza, pizza party, sauce, sausage, tomato, tradition, yeast. Bookmark the permalink. Making this again! We make this at least once a month now! Do you have an good recipe for whole wheat crust? Or a mix of wheat/white flours? Thanks!! I’ve never tried whole wheat crust but am a huge fan of King Arthur Flour recipes. This gets pretty good ratings and seems easy enough: http://www.kingarthurflour.com/recipes/a-tasty-whole-grain-pizza-crust-recipe. I love experimenting! If you do make a whole wheat crust, let me know how it turns out; I’d love to give it a try. Happy baking! Do you have any feelings on King Arthur Bread Flour for this recipe? I saw it at Whole Foods today and picked up a bag. I think the higher protein content is supposed to make for a chewier crust?? Maybe I’ll experiment with it and all purpose. I just got my pizza stone so I’m ready to rock n’ roll. Hey, sweets. Try it and let me know how it goes. I’ve used higher gluten flours and get a better chew to it so I think it should be great. I’ve been using Lancelot and let it rise longer and slower (cold) and it’s a nice chewy crust. 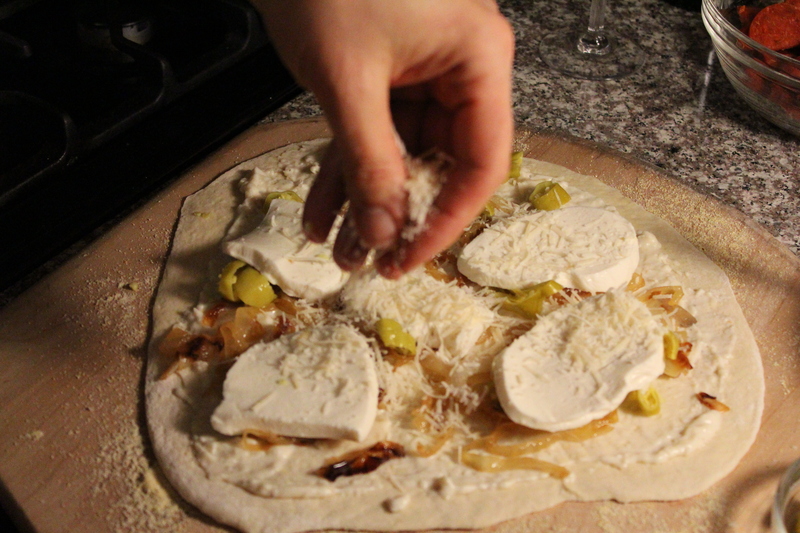 Still working on the perfect Naples crust though … hey, field trip! You in? Let me know what you think, Kat. The pizza is really easy to make. I’m heading over to check out your blog now. Thanks for reading! Ok, so I didn’t just have to make 1 batch of dough I had to make 2… need I say more. The girls loved the pizza,(especially making their own) and you are right so simple and delicious. Thanks Beth!! Oh, by the way, I am hearing a lot of chatter about Rueben bread, can’t wait to make that. So glad you and the girls liked it! Reuben bread this weekend – here’s hoping the “real” photographer shows up. Pretty sure she will since she’s a fan of the stuff and I pay in food! I am salivating too. Oh, Beth, I love you! I think of you every week as I feed my mamma and/or bake bread. Now I want to make pizza this weekend! My mother’s alive and well, too! She’ll make an appearance soon. Please make pizza and let me know what you think. All comments/critiques welcome. Thanks, toots!